We try to make it as easy as possible for businesses to promote themselves and consumers to find suitable products and services. One of the ways we accomplish this, is with our Equine Compare product search. Consumers simply search for a product on Equine Compare and we return results from all our retailers. Getting all those product details is no easy task. We've created our own specialist software to search selected shops and extract all the relevant product details. This process is fine tuned for each shop to ensure we are extracting details accurately and efficiently. Once included in our search results we check each shop for changes every 3 days. A drawback of this approach is that changes are required to our software whenever a shop changes their website design, which may lead to products being temporarily omitted. Hence our introduction of the following fast-track option. The appropriate data is exported from the shop's database. The results are saved on the shop's web server in a specific location. The format of the file is typically a comma-separated file (CSV) or an XML file. The following details would be included for each product: *product title, *description, *price, *web address of the products page, *web address of a thumbnail photo of the product. If the file includes non-equine related products, e.g. dog rugs, we also need a way to identify and exclude those products, such as a category name or id. The shop then simply informs us of the web address where the file is stored. Or if you want to use the fast-track method, tell us the location of the exported file on your web server. 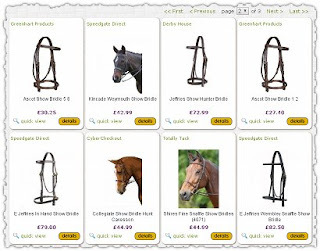 It's currently free to list your products on Equine Compare.